136 pages | 2 B/W Illus. 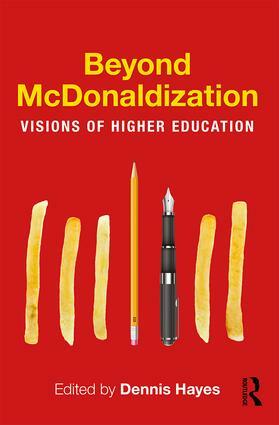 Beyond McDonaldization provides new concepts of higher education for the twenty-first century in a unique manner, challenging much that is written in mainstream texts. This book undertakes a reassessment of the growth of McDonaldization in higher education by exploring how the application of Ritzer’s four features efficiency, predictability, calculability and control has become commonplace. Can we regain academic freedom whilst challenging the McDonaldization of thought and ideas? Is a McDonaldization of every aspect of academic life inevitable? Will the new focus on student experience damage young people? Why is a McDonaldized education living on borrowed time? Is it possible to recreate the university of the past or must we start anew? Does this industrialisation meet the educational needs of developing economies? This book brings international discussions on the changing world of higher education and the theory of McDonaldization together, seeking to provide a positive future vision of higher education. Analysing and situating the discussion of higher education within a wider social, political and cultural context, this ground-breaking text will have a popular appeal with students, academics and educationalists. Dennis Hayes is Professor of Education at the University of Derby and the director of the campaign group Academics for Academic Freedom (AFAF).